Here’s this week’s Media Mix about the bestseller “Genpatsu Whiteout,” whose pseudonymous author has been the object of much speculation since, as he admits in the Tokyo Shimbun interview cited, he is a career bureaucrat. As a sidelight to the interview, the newspaper sought comments from other public figures who tend to get under the skin of the authorities. Lawmaker Taro Kono, the most prominent anti-nuke politician in the Liberal Democratic Party, said that he “hears” METI is “looking for the author” because what he wrote is way too close to the truth, and essentially “makes a bad situation even worse” for the ministry. Using his own experience as an illustration of what Wakasugi wrote about, Kono told Tokyo Shimbun, “I understand that power companies said to MPs who support nuclear energy, ‘If you shut Kono’s mouth we’ll buy tickets to your fund-raising parties. '” Shigeaki Koga, a former high-level official in METI who wrote his own book exposing the underside of the bureaucracy, confirmed Wakasugi’s description of officials spiking bills with terms like the ubiquitous sonota (“and others”) so that the authorities can interpret the law at their own discretion. “That’s part of bureaucratic DNA,” he said. 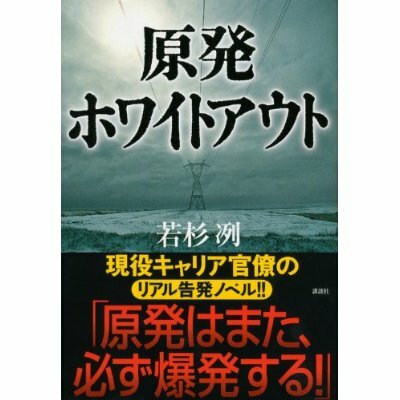 “They always make sure there are loopholes in regulations and operations so they can do whatever they want based on circumstances.” And as for Wakasugi’s “monster system” of high-level collusion between government and industry, Koga says that Tepco is well-known for its lavish “entertainment” spending on politicians and bureaucrats that somehow is passed off as being legal. “Bureaucrats on a career track, like Wakasugi, only think about being promoted, so they can’t speak out.” He called Wakasugi “courageous,” adding that he has to keep his identity a secret “so that he can continue collecting information” and, presumably, leaking it to the public. Wakasugi himself says that if the confidentiality bill is passed, and it seems certain it will, bureaucrats may become more tight-lipped, which means it will be more difficult for him to overhear what is really going on. “I won’t be able to write another novel like this,” he says. That is obviously the purpose of the law. The situation is slightly different for another insider-author who recently published a book about nuclear power under a pseudonym. @happy11311 is the Twitter handle of an engineer who has been working at the crippled Fukushima power plant. He constantly tweets about the reality of the cleanup, and has attracted more than 88,000 followers. At the end of October he published his own book under the name Happy. In an interview with the Asahi Shimbun, the author reveals he’s been an engineer for 20 years, and was at the Kashiwazaki Kariya plant in Niigata when it was hit by a massive earthquake in 2007. He claims news reports on the Fukushima crisis have been “mainly speculative and inaccurate,” so he felt it was his duty to “report the truth.” His primary concern is the use of inexperienced workers. Since experienced workers cannot remain in the plant for any length of time due to over-exposure, they have to instruct inexperienced workers to carry out operations remotely, and that leads to potentially dangerous mistakes. He is discouraged that the government has always tried to convince the media that the situation is stable, when it continually remains precarious at best. The media reports these pronouncements without really questioning them, a revelation that is hardly surprising but nevertheless gives rise to the notion that while the confidentiality bill suppresses the public’s right to know it may not actually change matters from a practical standpoint. As it is, the mass media doesn’t do a lot of proactive reporting toexpose official malfeasance and cynicism. As Wakasugi points out, the law’s most harmful effect would be stopping potential whistleblowers like himself and, to a lesser extent, Happy (who is an employee of a private company, not the government), and without whistleblowers the media has no sources with which to uncover these problems. But whistleblowers aren’t the only means available to investigative reporters. They just make their jobs easier. This entry was posted in Media and tagged Liberal Democratic Party, Nuclear power, Retsu Wakasugi, Tokyo Electric Power Company. Bookmark the permalink.